These are a great innovation and perfect for areas where you would like to place a diffuser but are worried about it getting knocked over. The clever design means that the pretty jar is filled with fragranced oil just like the conventional diffusers but the oil is drawn up through a wick inside the container and diffused from the wooden lid of the container rather than through reeds. This type of diffuser represents real innovation and would make a great gift for anyone among your friends and family who is very conscious of style and new trends in home decor. It is sound economic and environmental sense to refill your diffuser when it is spent, rather than purchasing a new one. If you want to change the fragrance, all you need to do is to wash the jar carefully with warm soapy water and leave it to dry before refilling. 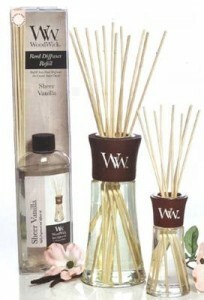 You can view the woodwick diffuser refill range with this link. Of course, if you already have a pretty reed diffuser bottle, you can use one of these refills with that too. Each refill holds the same as the large sized diffuser (7.4 fl oz) so will refill a small size at least three times making Woodwick reed diffusers and refills an excellent and economical choice for fragrancing your home.